The event was kicked-off by a presentation from acting CEO, Ahmed Al Shamsi who shared an overview of the company’s progress in 2017 and its plans moving forward. Acting Chief Executive Officer, Ahmed Al Shamsi addressing the gathering. Thuraya Telecommunications Company welcomed international and regional delegates from Africa, Asia, Australia, Europe, the GCC and North America to its 16th annual Partner Conference in Dubai from 10 to 11 April at the Four Seasons Resort. This year’s theme of “Better Tomorrow. Together” reportedly celebrates Thuraya’s relationship with its partners and distributers signifying the importance of collaborative efforts. 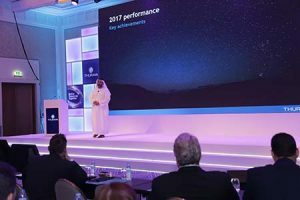 The event was kicked-off by a presentation from acting Chief Executive Officer, Ahmed Al Shamsi who shared an overview of the company’s progress in 2017 and its plans moving forward. The sessions that followed involved a number of guest speakers including Dietmar Schmitt, Head of Technologies and Products Division at the European Space Agency, as well as Dr. Muneer Zuhdi, CTO and Head of Global IoT Smart City Solutions at Nokia. During the two-day programme, Thuraya is launching several new products, and sharing information with partners about the growth plans for 2018 and beyond. The second day of the event will comprise of technical workshops as well as a product exhibition area by more than 15 exhibitors. The company unveiled a number of new products and services including Thuraya IP M2M – a telemetry solution for M2M connectivity in remote locations. Additionally, and to allow customers a convenient way to stay connected, Thuraya Talk, a Voice over IP (VoIP) service was launched for personal and professional use. The company also announced both Thuraya WE, the world’s first dual-mode Satellite and LTE hotspot and Thuraya Aero – an airborne data-sharing platform for in-flight connectivity. Apart from the strategic collaborations and service initiations,in 2017 Thuraya’s XT-PRO DUAL won the MSUA Top Land Mobility Satcom Innovation Award during the Satellite 2017 conference in Washington. The company also landed the MSS Operator of the Year award from SatellitePro ME.